Sloanes01924 372069work RestaurantSloanes is an Italian restaurant with passion, all the food comes right from the heart. Abdel Kamraoui and his team have created a vast menu with classic Italian and modern dishes all sourced from the finest local produce. Sloanes is located in the heart of Wakefield and is just minutes from Wakefield Westgate Railway Station. Adjacent to the Theatre Royal Wakefield and makes an ideal place to dine before enjoying a show. Sloane's chef's pride themselves on their creative flair and the skillful way in which they have reinterpreted classic Italian food, cooking using Yorkshire's abundant natural larder. The restaurant also has an excellent, well-edited wine list to compliment the delicious produce from the kitchen. Sloane's is characterised by sophisticated modern styling which we think you will love, whether it's business or pleasure that brings you here or to York House Hotel. The bright décor, big skylight and generous use of plants around the well-spaced tables give it a Mediterranean feel, while the traditional Italian food is served with an eye to presentation, which immediately sets it apart from its competitors. During the warmer months the terrace outside which becomes a sun haven and is a great place for relaxing with a glass of wine and delicious meal. Crisp pizzas, beautifully-prepared pasta dishes, a tempting choice of chicken and steak, plus daily seafood specials are enough to keep the most demanding diners happy. 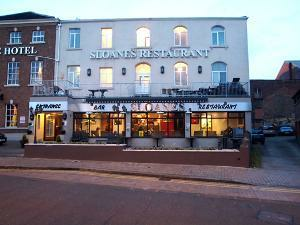 Sloanes is an Italian restaurant with passion, all the food comes right from the heart. Add to these a big choice of tasty starters, delicious desserts and well-chosen wine list and it's easy to understand why Sloane's is once again the restaurant of choice for those who appreciate good food. Please phone for more information on opening times. Located adjacent to Theatre Royal Wakefield.